The staff at the Young Legends Child Care Learning Center in Florida learned so much during the National Early Care and Education Learning Collaborative (ECELC). 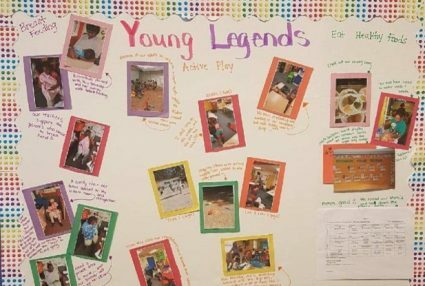 With each learning session, Nathalie Mason and her staff at Young Legends were able to bring back lots of information and new resources to make healthy changes in their classrooms. The changes started with interviewing breastfeeding mothers to understand their needs. Many breastfeeding mothers stated their need for a refrigerator, comfy chair, electrical outlet, privacy, and most importantly, support from the staff. With this knowledge the staff at Young Legends designated the nurse’s office as the “Nursing Headquarters” where mothers can breastfeed their infants. In addition, Natalie and her staff wanted to reduce the amount of processed foods that are served in the program. They decided to revise their menus by including black beans, sweet potatoes and kale, and only offering chicken nuggets once a month. Lastly, the center got active. In the morning, the teachers and kids do the “Cha-Cha Slide” and “Cupid Shuffle” to Kids Bop! They also created an “Hour of Power Workout” where they meditate before class starts. The children and staff have really enjoyed this. The workouts have also increased the kids’ water intake, so teachers make a conscientious effort to provide a pitcher of water on the playground at all times. Making these changes has been fun and invigorating for everyone. The program coordinator of the Cocoa Campus Child Development Center in Florida, Ashley St. Clair, participated in ECELC in 2016. Since then, the program has promoted healthier lifestyle habits for all staff and toddlers. OrganWise Guys are a set of engaging characters who teach children about the importance of good nutrition, physical activity and overall healthy lifestyles with the goal of preventing childhood obesity.